Are you a person who appreciates beautiful things? Would a Mystery Tour while enjoying a glass of fine wine tickle your fancy? 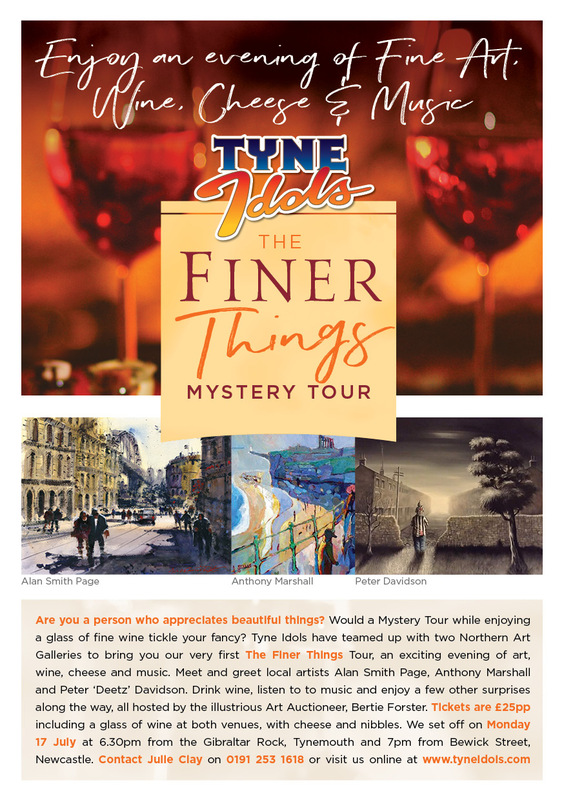 Tyne Idols have teamed up with two Northern Art Galleries to bring you our very first The Finer Things Tour, an exciting evening of art, wine, cheese and music. Meet and greet local artists Alan Smith Page, Anthony Marshall and Peter ‘Deetz’ Davidson. Drink wine, listen to to music and enjoy a few other surprises along the way, all hosted by the illustrious Art Auctioneer extraordinaire, Bertie Forster. Tickets are £25pp including a glass of wine at both venues, with cheese and nibbles. We set off on Monday 17 July at 6.30pm from the Gibraltar Rock, Tynemouth and 7pm from Bewick Street, Newcastle.